Everyone loves a Cindarella story. However, in the modern age of football, the chance of a team coming from nowhere to launch a serious title challenge is virtually zero. Generally the established order can only really be threatened by a club gaining a new owner and spending the money – Manchester City and Chelsea are two examples in the last decade. However, in Germany, fans of fairy tales may have a new set of heroes come the end of the season. Rewind back to May last year and Borussia Monchengladbach only survived in the Bundesliga by scraping through a relegation playoff against Bochum 2-1 on aggregate. Even that was an achievement though given the position the club had found themselves in when Michael Frontzeck had been sacked as head coach and was replaced by Lucien Favre. Bottom of the Bundesliga, with relegation seemingly a formality, Favre had no opportunity to bring in new faces with the January transfer window already closed. However, a resurgence late in the season saw them cling onto their Bundesliga status, and the trickle of promise has turned into a torrent. Back to the current day, Lucien Favre’s side find themselves fourth in the Bundesliga, almost guaranteed a Champions League position, one point behind Schalke and German superpower, Bayern Munich, and a further two points behind league leaders, Borussia Dortmund. He is beginning to give hope that success can finally be restored to one of Germany’s most famous and popular clubs – success that has eluded one coach after another for almost 35 years. Some of Germany’s most talented players have come and gone without silverware – Stefan Effenberg and Lothar Matthaeus are just two of the names that have played for Die Fohlen. The base for the resurgence this season has been the defence. Last season, Monchengladbach had one of the leakiest defences in the league. This season, they have the best defensive record – better than both Dortmund and Bayern Munich. 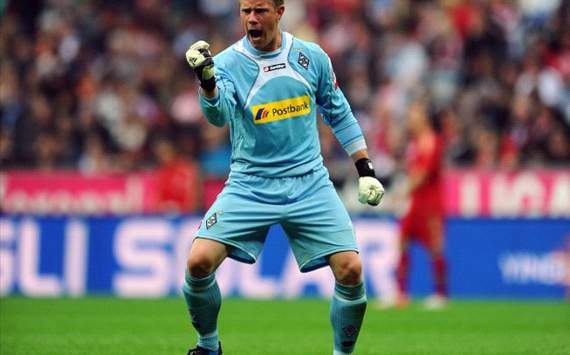 The man gaining the headlines for this is 19-year old keeper, Marc-Andre Ter Stegen. Despite the fact that he still has only 28 appearances in the Bundesliga under his belt, he is being talked about as a peer of Manuel Neuer, widely recognised as one of the best keepers in the world. Ter Stegen has won awards in every age group that he has played in, and it is only a matter of time until he is called up to Joachim Low’s full German squad. Thrown into the club’s relegation battle by Favre, he was a key reason for their survival, conceding only 4 goals in the 8 games he played from April onward. He has continued this excellent form this season, having conceded a mere 12 goals in 20 games, including 9 clean sheets (only Neuer has more clean sheets this season). He is a big presence, standing 1.89m, but has exceptional speed and reflexes for a relatively big man. He shows excellent body language, spurring his teammates on, and has quickly gained the respect of his defenders ahead of him. Most keepers tend to bloom in their mid-20s. Neuer only really began to come to the fore in his mid-20s, and Olivier Kahn was 24 when he joined Bayern Munich and came to prominence. So for Ter Stegen to be making such an impression at only 19, he joins the illustrious ranks of the likes of Gigi Buffon and Iker Casillas. However, the improved defensive record is not only down to the keeper. The experience of Dante in the defence, alongside either Martin Stranzl or Roel Brouwers, has been key. Dante has 3.8 clearances per match, while Stranzl and Brouwers have 4.8 and 4 respectively, suggesting they are quick to clear the ball away from the danger area. All three of them are only dribbled past 0.5 times per match, showing that passing them is a difficult task. The fullbacks, Tony Jantschke and Filip Daems, also provide additional support. While Jantschke is dribbled past 2.2 times per match, a club high, he also makes 3.4 tackles per match, which is also more than any other teammate. He also makes 2.9 interceptions per match, suggesting that he usually attempts to go for the ball and win it back quickly, rather than simply preventing his opponent from getting past him. Conversely, Daems only allows opponents to get past him 0.7 times per match, making only 2.8 tackles and 2.4 interceptions per match. However, there is a reason for this difference in styles. On Monchengladbach’s right-hand side, initially Reus and now Herrmann often track back well to support Jantschke. Reus has 2.1 tackles per match and is only passed 0.6 times per match, while Herrmann makes 1.9 tackles and is passed only 0.9 times. So, their support allows Jantschke to try and win the ball, knowing Reus or Herrmann are there to back him up if he fails to stop his man. On the left-hand side, Juan Arango provides much less support. With only 1.6 tackles and dribbled past 1.3 times per match, he is less capable defensively, meaning that Daems must hold his man up more, rather than take the risk of trying to win the ball every time. The defence is also backed up well by Favre’s formation, which includes two holding midfielders – Roman Neustadter and Harvard Nordtveit. Neustadter’s 3.3 tackles, the second highest in the team, and 3.7 interceptions, also the second highest, shows the key role that he plays in stopping opponents playing through the middle. Alongside Nordtveit, they create an excellent shield, and this unit of six players provides the freedom for the front four to express themselves. The front four consists generally of Juan Arango, Marco Reus, Patrick Herrmann and Mike Hanke. While there is a certain amount of flexibility, we usually see Arango on the left and Hanke through the middle. Early in the season, Reus would play on the right, but he has since switched to play through the middle and Herrmann has moved to the right. The star though has undoubtedly been Marco Reus. The 22-year old, who has recently agreed a deal to join Dortmund in the summer for €17.5m, has been outstanding this season, scoring 12 goals in 18 matches, as well as racking up 3 assists. Reus has electric pace and is capable of keeping the ball at high speeds. This is demonstrated by the fact that he makes around 3.4 successful dribbles per match, almost double anyone else in the side. He is also very unselfish. His average of 2.5 key passes per match is second only to Arango, suggesting that while he has not only scored almost 40% of his team’s goals this season, he is instrumental in creating chances for his teammates. On the opposite flank, Juan Arango has had an excellent season. His 7 assists put him in the top 10 in Europe’s top leagues, while he also lays on 2.7 key passes per match, the highest in his team. The relatively low level of his dribbles per match compared with Reus suggests he tends to look to play the killer pass, rather than look to beat his man. This is backed up by the passing statistics – Reus averages 39.6 passes per match compared to Arango’s 50.5. While Reus has a better success rate, this only serves to back up the suggestion that Reus tends to beat his man, then lay on the simple pass, while Arango looks to play the killer pass. While Mike Hanke’s statistics appear to suggest that he is nothing special – only 4 goals and 2 assists in 19 appearances, the third lowest shots per game rate of any of the front four, the fewest key passes and dribbles – he does play a key role. He provides a focal role for the attacks, employing the attention of the defenders allowing additional space for the likes of Reus and Arango. He is excellent at making clever runs to create space, even if he doesn’t receive the ball – something that is difficult to find from the statistics. The other interesting thing to note is the possession statistics. Monchengladbach have 32% of their possession in their own third, suggesting they are very comfortable playing it around the back – something backed up by the fact that four of the top six passes in the team by quantity and success rate are the back four, with Neustadter also featuring. This 32% is higher than any other side in the division. Similarly, they have only 22% of their possession in the opposition third – again the lowest in the division. However, they average 14 shots per match – the fifth highest in the division. This fits in nicely with Favre’s style – a patient build-up from the back, but once they get it forward, they attack quickly and dangerously. When they get the ball into the final third, they tend to create the opportunity to get the shot away. They started the season by shocking Bayern Munich, winning 1-0 at the Allianz Arena. Since then, they have proved that it was no fluke, holding Dortmund and Leverkusen to draws, hammering fancied pre-season contenders, Werder Bremen, 5-0, before completing the double over Bayern Munich, beating them 3-1 at home. While they are not a one-man team, the major worry would be an injury to Marco Reus. 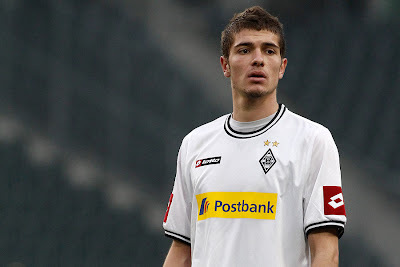 He has only missed two games this season, through a broken toe, but Monchengladbach only picked up one point from those two games, scoring one goal. However, if they can keep him fit and firing, the title will remain a real possibility. The real challenge will be next season. They have already lost Reus, joining Dortmund in July, and scouts will undoubtedly be sniffing around the likes of Neustadter and Ter Stegen. 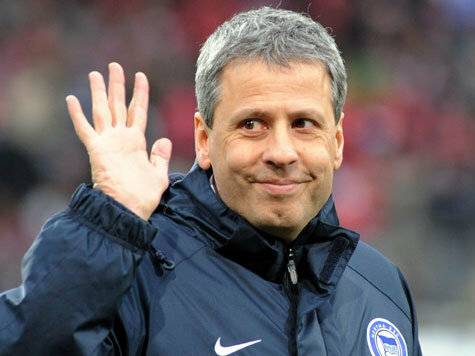 Indeed, Bayern Munich have already suggested that they see Lucien Favre as a future coach of Bayern. However, fans of Monchengladbach will be optimistic that Favre will stay with them for next season, and with the Reus’ money, strengthen further ready to launch another attempt at the long-elusive title.